Home > Feature > One simple truth when learning Kanien’kéha: try! One simple truth when learning Kanien’kéha: try! With two months left in the Kanien’kéha Ratiwennahní:rats Adult Immersion Program, Paxton Kahentaié:sen Phillips had a simple answer when The Eastern Door asked how to keep the language alive and thriving in Kahnawake. Phillips is the first of the graduating class to share her journey with The Eastern Door, and said she always intended to enter the program and learn Kanien’kéha as an adult at the Kanien’kehá:ka Onkwawén:na Raotitióhkwa Language and Cultural Center (KOR). 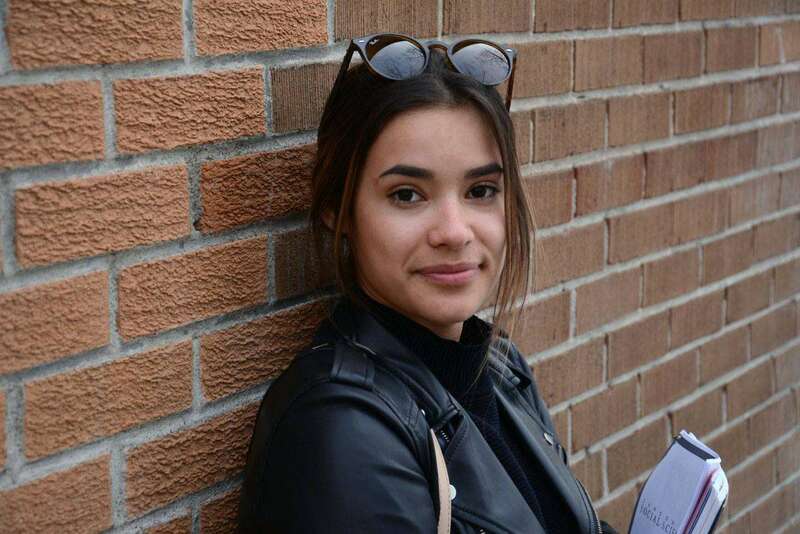 The 20-year-old first entered college out of high school, but, like her cousin Dade Hemlock, entered the language program adding another young woman in the family embracing the challenge of learning Kanien’kéha. “I knew that this was always something I wanted, and the application process had just started so I got an application and got accepted,” said Phillips. Entering the program, Phillips’ language skills were less than great, to put it kindly. “I didn’t understand anything that they asked in my interview at all. I could basically say my name and how old I was,” she said. Phillips said it was the effort she put in that increased her skill over time to where she is now. In addition to school full-time, Phillips also juggled as many as four jobs at once to pay her bills and keep her afloat. The sacrifice, however, is worth it, she said. Finishing the program, Phillips is excited with her progress, but with reservations. “I’m sad, but I’m excited and I’m proud of myself for getting through it, but I’m scared,” said Phillips. The fear comes from knowing that those without regular practice speaking the language every day often see their abilities slip overtime. Phillips will enter Dawson College in the fall, knowing the change in scenery will mean work to ensure she maintains her ability. Knowing the struggle coming to keep her ability high has prompted Phillips to come up with some strategies. “I can continue visiting the elders that I’m already visiting right now, and I could ask my classmates to hang out and do stuff and we’ll just speak Mohawk, but you never know. I’m worried,” she said. Worries aside, Phillips’ dedication to learning her language is something that will always fill her with pride. “I’m not shy anymore,” she said. “I remember I would go on field trips with Karihwanoron and people would ask me a question in Mohawk because they thought I spoke, and I’d be so embarrassed because I didn’t know what they were saying and I couldn’t answer them.